label for map 1 (e.g. walthamstow) - leave blank if not required. label for map 2 (e.g. brooklyn) - leave blank if not required. Celebrate the serendipity of two soul mates finding each other in this world with a map print that captures the home towns of each. It's amazing that we ever find "the one" really when you think how big our world is. Sometimes your soul mate comes from the next town along, sometimes they are from the other side of the world. Our couples map print is the ideal way to celebrate finding each other. 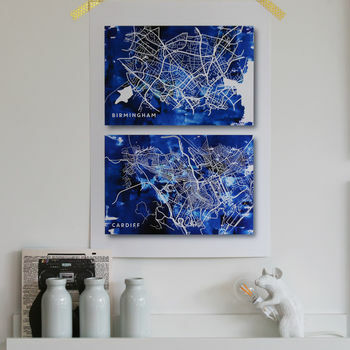 A map for each, brought together in one beautiful abstract print. The rivers and roads that wind through the landscape and create our cities and towns are the heros in this print. We take out all the other details you might normally see on maps, like road names. This is such an excellent wedding or engagement gift for a couple, celebrating the towns from which they originate and marking the new chapter of their lives together. For the first wedding anniversary, which is traditionally paper, this print makes an original and stylish present. Or if you have two places that have become favourite holiday destinations - why not capture them here and have fun looking back over the adventures you had there? A postcode is brilliant to work from and we'll centre the map on that. But you can equally just give us a place name, like Nottingham for example, and we'll base that map on the centre of Nottingham. A quick note - some cities are HUGE and it won't be possible to get, say, the WHOLE of New York on one of our maps. We'll focus on the very centre of cities like this unless you give us any other direction. (For New York as an example, we'll focus it on the 5th Avenue/59th street bottom of Central Park). Our couples home town map prints are individually designed to your requirements and a giclee print is then created using ultrachromatic professional inks on archival enhanced matte paper. 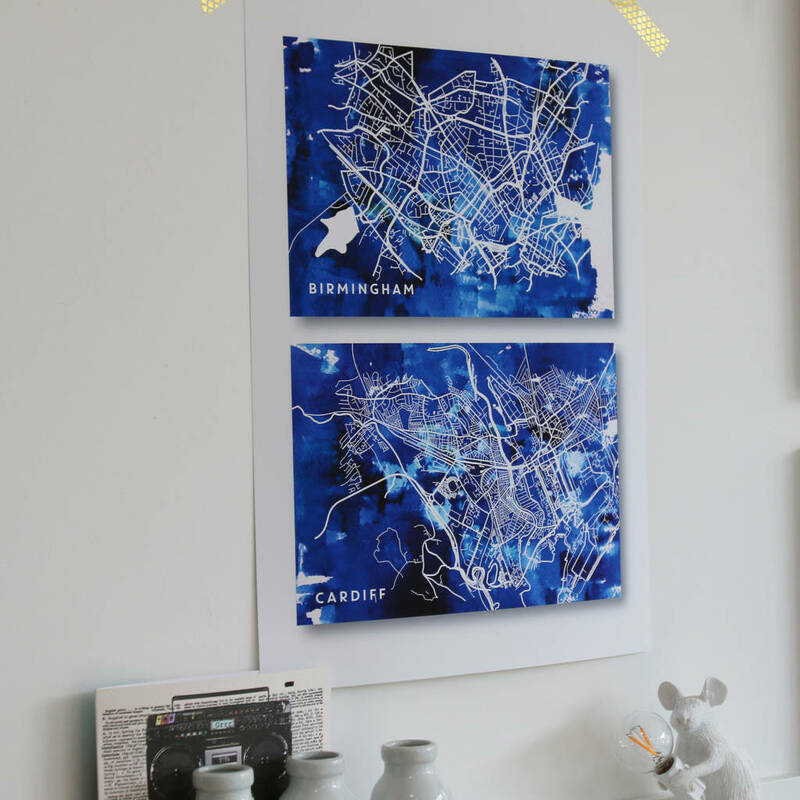 These wonderful map prints are available in a number of sizes and finishes to suit. This product is dispatched to you by Betsy Benn.